We See the World with the Top Down | Sprezzatura, Y'all! It’s getting to be very fall-like here now and it’s perfect convertible weather. Makes those 90 degree days a distant memory (well, maybe not so distant). The BMW with no AC is not quite an antique, but it’s close. It was quite a car in its day, and it still runs very good, but it’s a little frayed around the edges. And the top. The top used to come down with the push of a button. The button is still there, but these days it’s just ornamentation. You have to manually take the top down. We got a lesson from our landlord/car lessor/friend, but it’s been a while. So when we tried to do it, we got into a little bit of pickle. We got halfway there and couldn’t go any further and we couldn’t go backward. We jiggled and nudged and tugged, but couldn’t get it to move. We thought we’d broken it for sure and would either have to drive around with half a roof or find a mechanic. Finally, after some cajoling, it cooperated and we were in the convertible business. Now we do it with ease and today was perfect top down weather. We had some errands to run and went to Sansepolcro to find a L’Ebolario shop. We found it and had a great time buying our favorite soaps, creams and shampoos. 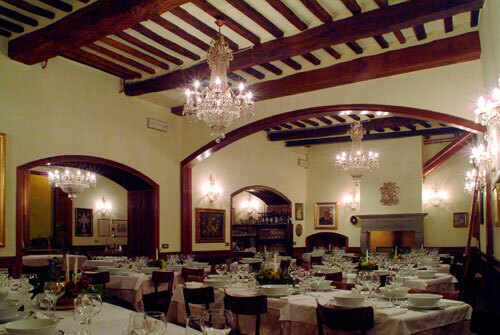 Then we had lunch at a great place that had the most gorgeous dining room. We’ll eat in there when the weather doesn’t allow al fresco dining, but for now we have to be outside at every opportunity. We had a big lunch day. A very big lunch. We had a plate of beautiful fried squash blossoms, a panzanella salad, and a wonderful raviggiolo cheese with tomatoes and avocados. Our little farm stand that is run by Sylvia and her husband usually has this cheese and I’ve always been curious about it. It’s a very fresh cow’s milk cheese that is skimmed off during the beginning of making ricotta cheese. It is consumed within 48 hours of production. It’s almost a cross between sour cream and cottage cheese. It’s smooth and tangy and was great with the tomatoes. The avocados were an interesting addition, but it all worked together. Sorry, no pictures – we tore into it too fast. Then we had pasta. 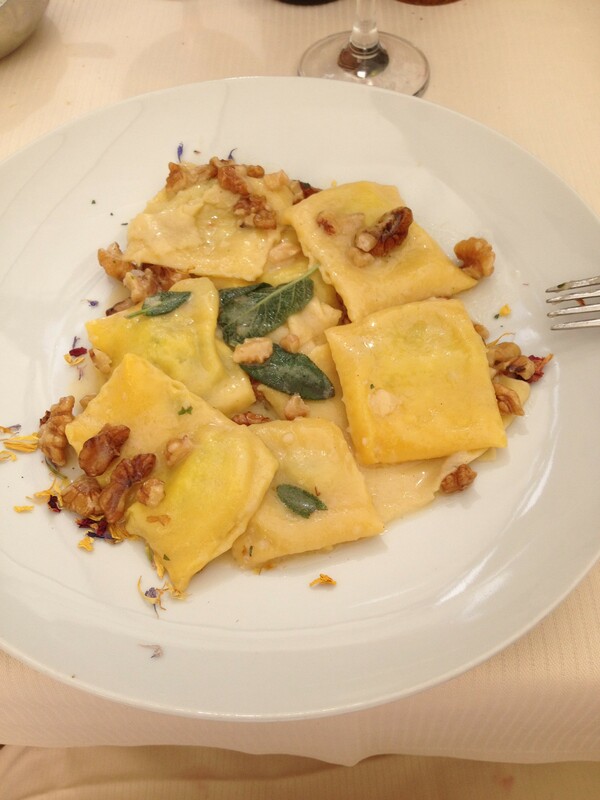 I had a tortelloni with butter, sage and walnuts and my husband had a pappardelle with a ragu. Both were great, and we ate until we just couldn’t hold anymore. Then we got gelato. On the way back home, we passed an olive grove on the hill leading up to Anghiari. This sign was posted on one of the trees near the road. “Who does not respect the environment is not worthy to live”. We love this handmade sign with such a powerful sentiment posted on this gnarly olive tree. You stop and read that, in that place, and you think, how true. How can you not respect the environment when you see such magnificence everywhere you look? And you can see it all with the top down. Am so enjoying reading about your wonderful adventure. Can not wait to join in. Soon you will living La Dolce Vita! It’s wonderful experience and we can’t wait to share it with y’all.